- BULGARIE - Kozareva - A well preserved skeleton from the copper age has been discovered in an archaeological reserve in Kozareva mound near Kableshkovo in Pomorie. The discovery marks an exciting new development for the village that was also a centre for the pottery industry during the fifth century BCE. According to the head of the excavation, Professor Petya Georgieva, this is the first confirmed tomb from such an early period in southern Bulgaria. The tomb was apparently intact and the bones well preserved. It is still unclear whether the necropolis, in the Neolithic village, which was discovered five years ago, adheres to the first funeral rites characteristic of the Black Sea region. Scientists claimed in 2009 that the discovery of the oldest ceramic kiln in the Balkans had helped to shed light on the beginnings of civilisation on the Bulgarian coast. Archaeologists hope that the most recent find will help reveal what happened to the dead in the copper age. "In the mound we found products of human skulls such as the rondeli, a circle of skulls with drilled holes in them so they can be attached to the neck," says Georgieva. 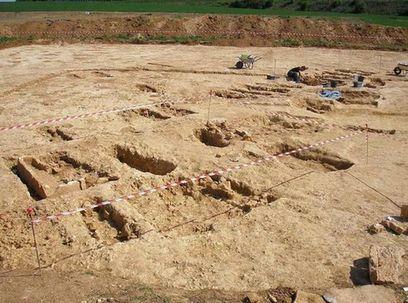 A separate neolithic tomb, discovered, near Burgas is expected to provide clues regarding the ethnicity of Bulgarians of that era. 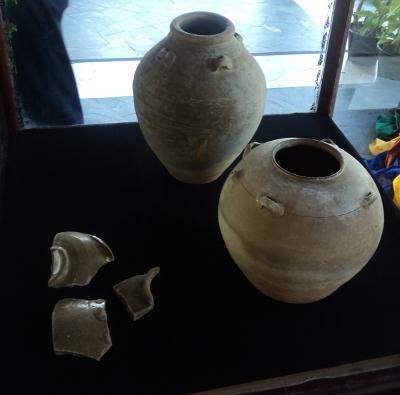 - THAILANDE – Phuket - An inquiry into the whereabouts of ancient beads, ceramic vases and glass shards excavated by a Phuket archaeological team in 2005 has revealed that the artifacts are safe on the island. The relics are all estimated to be more than 2,000 years old. The first excavation was in Ranong in 2005 and a second site was discovered in a different Ranong district in 2010. More than 1,000 samples were collected, including etched beads, rouletted ware, crystal stones and stone instruments used to make the beads. - ROYAUME UNI – Kempsey - Eight skeletons have been found in a Worcestershire village where flood defences are being built. About 12 graves were found in Kempsey by the Environment Agency when they were digging trial trenches as part of an archaeological excavation. The skeletons, thought to be medieval, are being exhumed and the remains will be recorded before they are reburied. It is thought that the bodies were originally buried at St James Church, which was built in the Norman period. - TURQUIE – Tell Tayinat - A team of archaeologists led by Tim Harrison, from the University of Toronto, have discovered a beautifully carved stone lion that dates back around 2,800 years. It stands nearly four feet tall and appears to be roaring. Tayinat had been re-settled 3,200 years ago, at a time when cities and civilizations across the Middle East were reeling from an invasion of people from the Aegean known to us as the "Sea People." The team has been excavating a temple at Tayinat that dates to this time and presumably this is where the lion was found. The lion dates back to a time when Tayinat would have been the capital of a small independent kingdom, possibly called Palastin. In 738 BC this kingdom came to an end when the Assyrians under Tiglath-pileser III conquered the city and incorperated it into their empire. It should be noted that in the 1930's archaeologist Robert Braidwood excavated at Tayinat and found lion statues of his own. 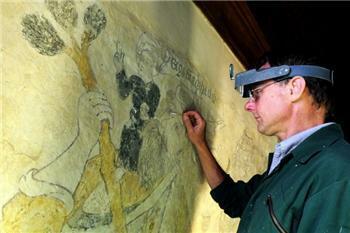 - ROYAUME UNI – Shorwell - Conservation work on an important medieval wall painting in St Peter’s Church, Shorwell, should be completed next week. The conservator Peter Martindale is painstakingly securing flakes of the original paintwork with specialist adhesive to ensure the image of St Christopher carrying the Christ child is preserved for future generations to enjoy. The large painting, situated above the doorway of the north porch, is one of only two medieval wall paintings in the country to feature scenes from St Christopher’s life. The painting, which dates back to 1440, was covered in a lime wash at the time of the Reformation and was rediscovered in the late 19th century, when it was cleaned and conserved. 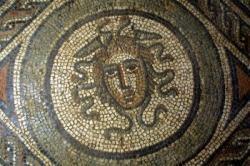 It underwent further conservation work in first half of the 20th century and in the 1960s. - ROYAUME UNI – Brading - A break in digging at Brading Roman Villa means conservation work can be undertaken on the mosaic floor. The mosaic floors at Brading are unique in their design and it has been five years since their last cleaning. The summers of 2008, 2009 and 2010 saw extensive archaeological investigation at the site, led by Prof Sir Barry Cunliffe, which led to the discovery of an aisled hall, bath house, burial ground with cremated remains and an Iron-age settlement. - EGYPTE – Mersa Gawasis - Recently, however, a series of remarkable discoveries on a desolate stretch of the Red Sea coast has settled the debate, proving once and for all that the masterful building skills of the ancient Egyptians applied to oceangoing ships as well as to pyramids.Archaeologists from Italy, the United States, and Egypt excavating a dried-up lagoon known as Mersa Gawasis have unearthed traces of an ancient harbor that once launched early voyages like Hatshepsut’s onto the open ocean. Some of the site’s most evocative evidence for the ancient Egyptians’ seafaring prowess is concealed behind a modern steel door set into a cliff just 700 feet or so from the Red Sea shore. Inside is a man-made cave about 70 feet deep. - FRANCE – Migné-Auxances - En début d'année, sur le tracé de la ligne à grande vitesse Sud-Europe Atlantique à Migné-Auxances, deux découvertes majeures ont été faites. L'une sur le site de Malaguet ; l'autre sur un site resté plus confidentiel, pour éviter d'éventuels pillages. Il est désormais recouvert. Suivant le diagnostic de l'Inrap, l'Institut national de recherche et d'archéologie préventive, le champ d'investigation était relativement réduit. Il est donc possible que la nécropole soit plus étendue. Quarante-huit tombes ont été mises au jour à cinquantaine de centimètres de la surface du sol. Il s'agirait d'une nécropole chrétienne datant de l'an 620, d'après une datation au carbone 14, ce qui correspond à la période mérovingienne (447 à 751). Le site est traversé par un fossé large de deux mètres et antérieur à l'édification de la nécropole car certaines tombes le recouvrent partiellement. « Les tombes sont orientées tête vers l'Ouest, pieds vers l'Est sauf deux d'entre elles certainement par souci de regrouper plusieurs sépultures, explique Guillaume Seguin. Elles forment quatre arcs de cercle pointés vers l'Ouest. La plupart des corps ont été inhumés à même le sol, les corps étaient entourés de planches de bois maintenues latéralement par des blocs de pierre. » Quelques sarcophages très abîmés par les labours ont été trouvés. Aucun n'avait de couvercle. Un seul objet a été découvert, une boucle de ceinturon en métal. Aucun autre mobilier n'ayant été mis au jour. Pour les archéologues, il est vraisemblable que les tombes ont été visitées avant leur passage. - FRANCE – Esvres – A la tête d'une équipe d'archéologues et d'étudiants en archéologie, Philippe Chimier est le responsable Inrap de la campagne de fouilles qui s'effectue jusqu'à la fin de ce mois de juillet dans le bourg. Les sondages d'un mètre sur un mètre sont réduits. Ils sont réalisés par des groupes de deux composantes : l'une sonde le terrain et l'autre relève la topographie. A l'issue de l'analyse de relevés, on en saura un peu plus sur les remblais de l'époque médiévale du XI e siècle situés dans le bourg et sur la ville romaine et gauloise sise sur le haut du plateau derrière l'ancien château. Les relevés de l'époque médiévale révéleront-ils d'autres couches inférieures d'occupation par les humains ? Cela conduirait à de nouvelles prospections plus en profondeur. - BULGARIE – Veliko Turnovo - The fourth archaeological season has begun with auspicious discoveries in the courtyard of the St Peter and Paul church in Veliko Turnovo. Professor Nikolai Ovcharov, head of excavations, said that his team is finding gold and silver ornaments on an almost daily basis. In the first few days of the expedition, archaeologists discovered a large part of the dining room of a monastery. 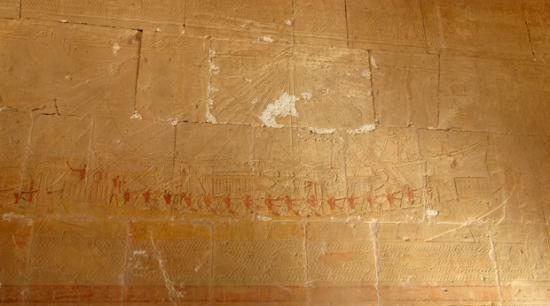 The highlight, however, has been numerous unique wall paintings from the 15th century. Twelve pictures of saints and inscriptions in old Bulgarian have also been recognised. Archaeologists believe that an earthquake in the 16th century accounts for the monastery's fallen paintings. As was customary in that era, all images that were destroyed had to be honoured through burial in tomb memorials. "The subject of numerous pieces is the image of St Panteleimon, who was a saint and highly esteemed healer," says Hitko Bachev, an archaeologist at the scene. In less than four years in the courtyard of the monastery, specialists have discovered more than 300 pieces of gold and silver jewellery. The latest discovery is a special silver ring with preserved gems in two colours - brown and milky white. The ring is extremely well preserved and holds an image of a man with a crown. "This ring is certainly not made in Bulgaria," says Ovcharov. "Whether it was made in ancient times or in the Renaissance, it comes from Western Europe, probably Italy," he said. "In that period it was fashionable among the emerging artisan class who could afford such expensive jewellery." On their current mission, archaeologists have been entrusted with discovering monastery buildings within the complex; historical evidence suggests that this is one of the largest complexes of the Bulgarian Middle Ages. 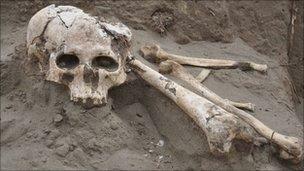 By the end of the summer archaeologists hope to have discovered a royal necropolis.